This month's challenge for the Creative Cooking Crew is rice. As an Armenian, rice pilaf is a serious staple in my kitchen, but considering this month's challenge I definitely wanted to step outside of my usual rice box to create something totally different. I considered doing something Asian with rice, but finally settled on Spanish instead. 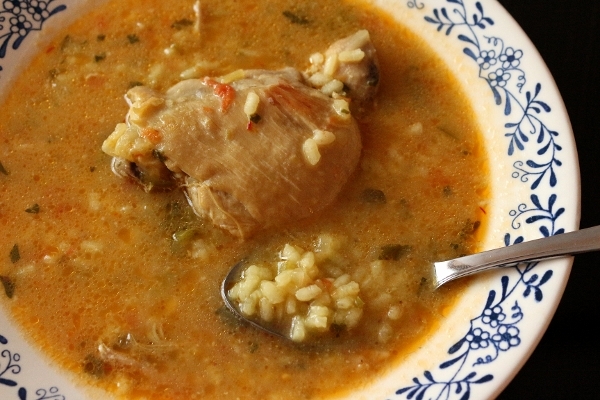 I recall a wonderful dish of Soupy Rice with Lobster that I enjoyed last year in Puerto Rico. It's truly unforgettable and has been on my mind since the trip. 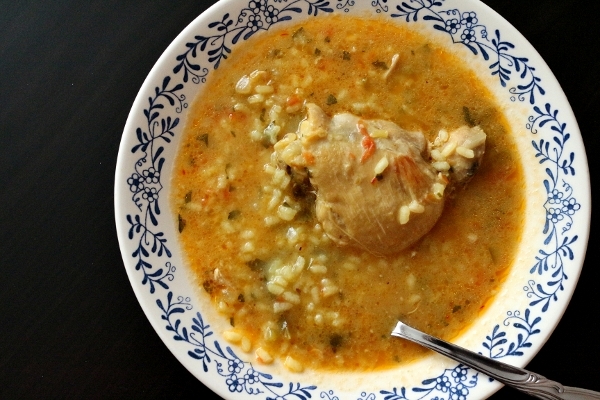 This past fall, I received a review copy of Spain by Jeff Koehler which contains recipes for both Soupy Rice with Lobster and also Soupy Rice with Free-Range Chicken. Although the lobster variation is still on my to-do list, it's a bit more time consuming and complicated than the chicken version, and so I decided to start with chicken instead. The recipe calls for free-range chicken legs, which are larger than typical chicken legs. In order to save some time and effort, I purchased bone-in chicken thighs, removed their skins and simply used these instead. I used 8 thighs in total, delegating 2 thighs per serving. 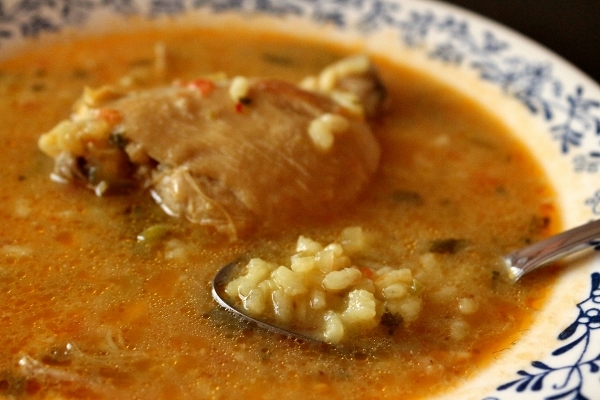 Bomba rice, or other short or medium-grain Spanish rice is required for this recipe. These types of rice are typically used for paella (another Spanish rice dish I considered for this challenge). 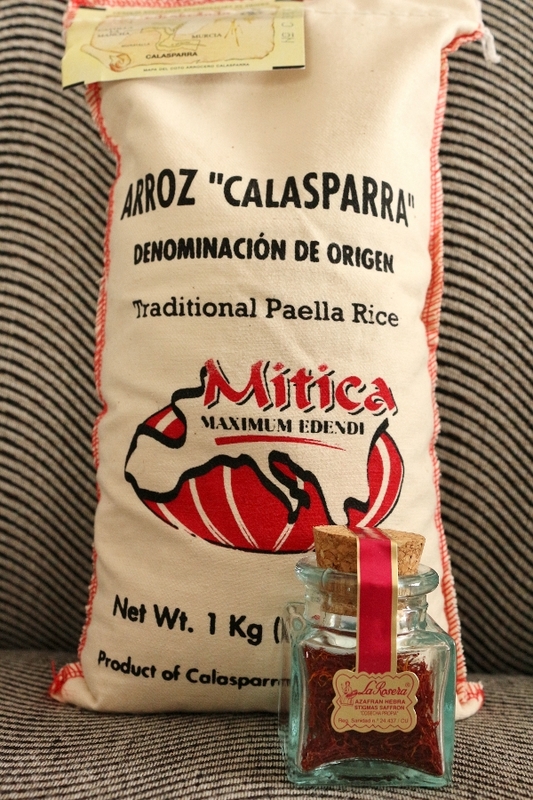 I ordered some Calasparra rice from Amazon.com and it turned out to be really convenient and a great deal. I paid just over $8 with free shipping, which arrived 2 days after I ordered it! The price has since gone up (at the time of this post), but I'm sure if you kept an eye on it, the price may go down again at some point. 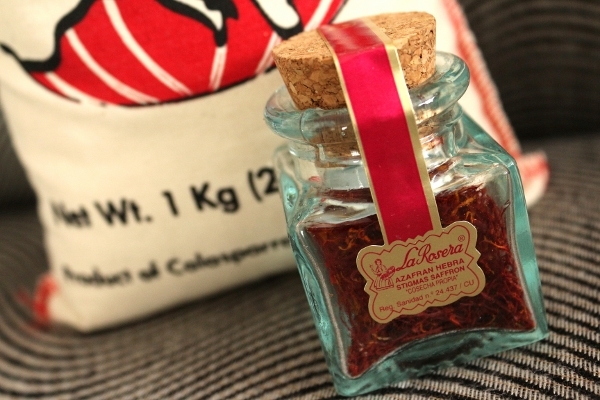 This rice is really special, and a necessity for this dish. It is starchier than other rice, and yields a great al dente type of bite to the dish, even after absorbing tons of delicious liquid. 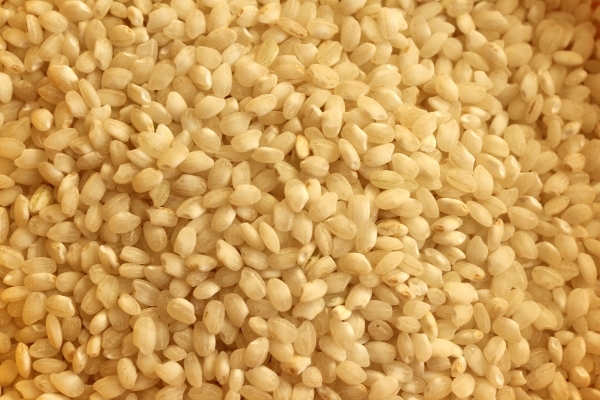 This particular type of rice absorbs a lot more liquid than traditional rice, which really sets it apart. I was also really excited to use some Spanish saffron my best friend had actually brought for me from a trip to Spain this past year. It was the perfect occasion to crack open the bottle for this truly authentic Spanish rice dish. 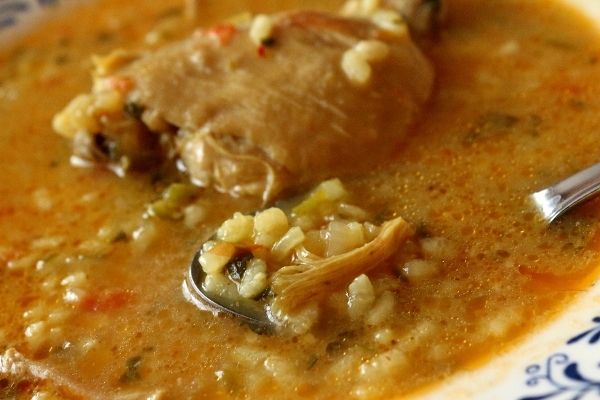 It's not exactly soup and it's not exactly rice, but more like a stew featuring fork-tender, fall-off-the-bone chicken, al dente rice, and a stunning broth featuring onions, peppers, tomatoes, garlic, parsley, saffron, and even almonds which are used to thicken it. 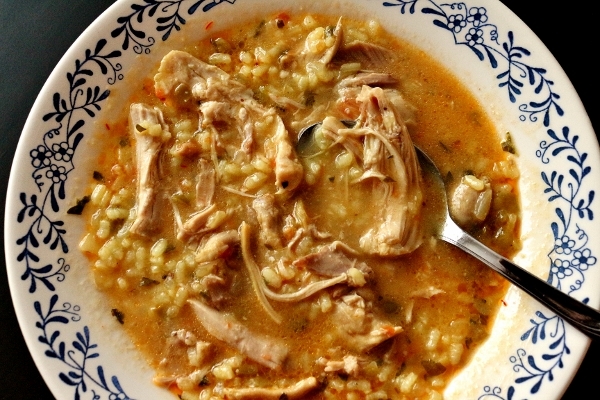 This dish is so flavorful from the broth to the chicken to the rice, that we couldn't stop eating it! Just beware that it really is best served immediately, as the rice will continue to absorb liquid as it sits, making it less soupy over time. 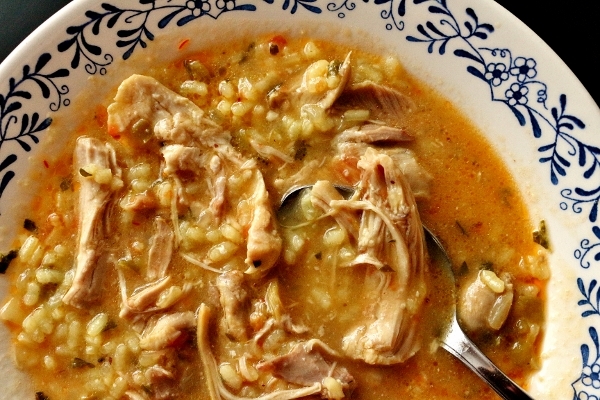 Please check out the roundup of rice recipes at Lazaro Cooks on February 27th! Remove the skin from the chicken. Split the legs into drumsticks and thighs, and then cut each in half crosswise through the bone to get eight bone-in pieces. Pick out any small bone shards. In a Dutch oven or another heavy pot, heat the olive oil over medium heat. Add the chicken, onion, green pepper, and tomatoes. Season with salt and cook until the chicken is browned, about 12 minutes (I allowed the chicken to brown on one side and then flipped the pieces over before adding the vegetables, otherwise the chicken won't really brown). Stir in the garlic and cook until fragrant, about 1 minute. Pour in the wine and simmer for 10 minutes. Cover with 8 cups water, bring to a boil, lower the heat, and gently simmer uncovered for about 45 minutes, until the chicken is tender and the liquid has reduced by about one-third. Meanwhile prepare a picada by adding the almonds, parsley, and 1 or 2 tablespoons of the simmering liquid to a small food processor and blending until smooth. 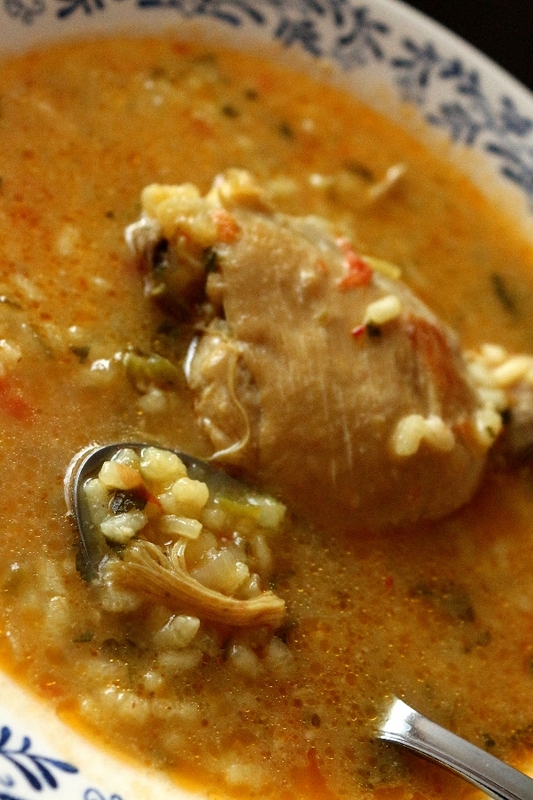 To the simmering pot, sprinkling in the rice and the saffron, crushing it between your fingers, and stir in the picada. Cook uncovered until the rice grains are nearly tender but still have a definite al dente bite to them, 14 to 16 minutes, depending on the rice. Add more water if needed to keep it nice and soupy. Remove the pot from the heat and let it sit covered for 3 to 4 minutes. Ladle into bowls and serve immediately. The rice will continue to absorb the liquid the longer it sits. *Free-range chickens tend to be generously sized, weighing up to 8 pounds. I used regular (not free-range) chicken thighs, which saved some of the prep for the dish and still yielded an amazingly delicious and comforting result. *To shake things up a bit, in autumn, add a handful of mushrooms, or in the spring add some trimmed artichokes or fresh shucked peas or fava beans.